Parking in the area of Rhinegeist Brewery is very tight. 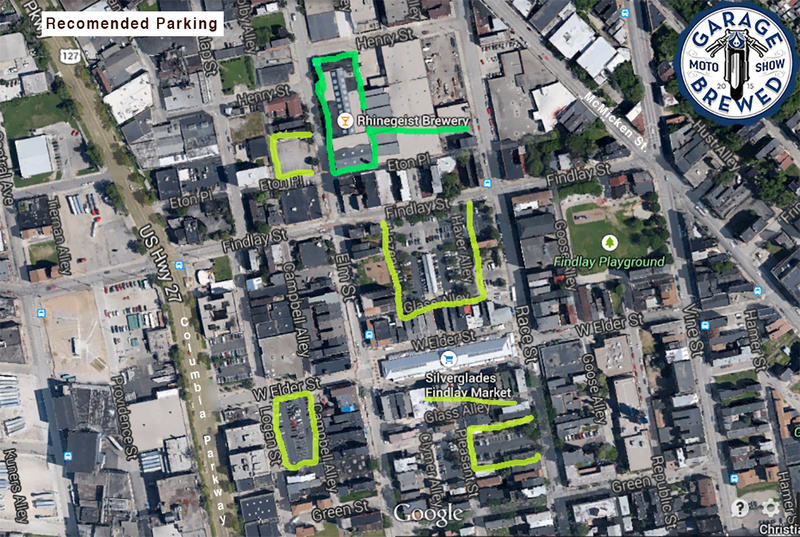 The map below outlines a few surface lots nearby including Findlay Market parking lots North, East & West. This is an older part of town that is just now getting large amounts of renovation dollars allocated. Some would call it transitional or dodgy. We will have valet service at the front door from 4pm – midnight. The BEST OPTION is to park closer to downtown (south of Liberty street) and take a taxi cab or Lyft car or Uber car ride right to the brewery front door. New For 2017: Easier To Get There! The new Cincinnati streetcar goes right by the front door. Allowing you to park in a garage downtown and simply ride to the event. https://www.cincinnati-oh.gov/streetcar/ Some recommended garages include the Washington Park garage, Mercer Garage, Fountain Square Garage, 5th & Race street garage, or any surface lot or steet parking. Then hop on the Cincinnati Street car and take a fun ride to the Brewery District in OTR and exit at the Rhinegeist brewery front door. Recommended parking lots near Rhinegeist Brewery. A Taxi Cab or the street car is a better idea.